The Waco C series were the firm's first successful cabin biplane design, and was based on the F series airframe. The Model C series had a raised centre and rear fuselage to form a four-seat cabin which was entered through a door over the lower wing and had a rather ugly framed rear-view window dispensed with in the later standard cabins. The initial QDC model of 1931 had a 165 hp (123 kW) Continental A70 cowled engine and was fitted with a triangulated shock-cord tailwheel undercarriage. 1932 brought the OEC and UEC models which were powered respectively by the 210 hp (157 kW) Kinner C5 and the 210 hp (157 kW) Continental R-670. Continuous refinement and improvement by Waco Aircraft resulted in production of various sub-models continuing until 1939. In 1935, Waco introduced its Custom Cabin series (which featured a sesquiplane layout without ailerons on the lower wing) and decided to differentiate between the Standard and Custom Cabin types by appending an S to the model designator. in 1936 the C-S was replaced with an 'S' signifying 'Standard'. The Standard Cabin series, with its cabin comfort, proved to be popular with private pilot owners. Many were purchased by small commercial aviation firms and non-aviation businesses. Approximately 135 Standard Cabins series aircraft of several sub-models are currently registered in the USA. 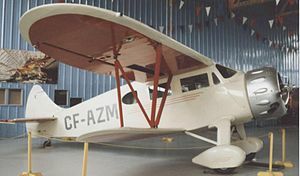 The Waco C series included all cabin models 1931-1935, and Custom cabin models from 1936, produced by the Weaver Aircraft Company (Waco), Advance Aircraft Co. and Waco Aircraft Co. in Ohio, USA. 300 hp (224 kW) Jacobs L-6 engine. 17 built, 2 modified to EGC-8. 285 hp (213 kW) Wright R-760 engine. 2 built. 320 hp (239 kW) Wright R-760 engine. 38 built. 3 used by US Navy &amp; Coast Guard as J2W. Menasco Pirate inline engine. Unknown number built. 240 hp (179 kW) Continental W-670 engine. None built. 225 hp (168 kW) Jacobs L-4 engine. Possibly none built. 285,400 hp (212,823 kW) Jacobs L-5 engine. 28 built. 210 hp (157 kW) Continental R-670-A or 225 hp (168 kW) Continental R-670-B engine. 4 built. 225 hp (168 kW) Jacobs L-4 engine. 50+ YOC &amp; YOC-1 built. 300 hp (224 kW) Jacobs L-5 engine. 7 built. 250 hp (186 kW) Wright R-760 engine. None built. 285 hp (213 kW) Wright R-760 engine. 11 built. 320 hp (239 kW) Wright R-760 engine. 20 built. USCG used 3 as J2W-1. 300 hp (224 kW) P&amp;W Wasp Jr. engine. None built. 210 hp (157 kW) Continental R-670 or 225 hp (168 kW);hp W-670-K or 220 hp (164 kW);hp W-670-6. Probably none built. 250 hp (186 kW) Continental W-670 engine. 225 hp (168 kW) Jacobs L-4 engine. 13 built. 1 ex-RAAF example re-engined with 200 hp (149 kW);hp DeHavilland Gypsy 6 inline engine. 285 hp (213 kW) Wright R-760-E1 engine. 320 hp (239 kW) Wright R-760 engine. Brandley, Raymond (1981). 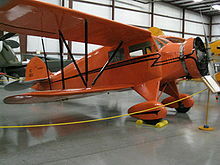 Waco Airplanes - Ask Any Pilot - The Versatile Cabin Series. R.H. Brandly. ISBN 0-9602734-2-5. Brandley, Raymond (1989). Waco Airplanes - Ask Any Pilot - The Authentic History of Waco Airplanes and Biographies of.... R.H. Brandly. ISBN 0-9602734-0-9. Juptner, Joseph P. U.S. Civil Aircraft Vol. 1 Los Angeles, California: Aero Publishers, Inc., 1962. Library of Congress # 62-15967. Kobernuss, Fred O. Waco - Symbol of Courage and Excellence unk : Mystic Bay Publisher, 1999. ISBN 1-887961-01-1.